Home / Mediums / Garrett, Eileen J. This photograph of Eileen Garrett later in her life is from the 1983 book Strange Talents. 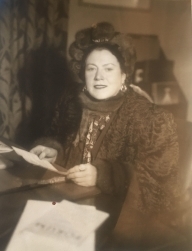 Eileen J. Garrett (1893–1970) was an Irish Medium, founder of the Parapsychology Foundation (PF) in New York City and a leader in promoting the Scientific study of paranormal phenomena. Eileen Garrett volunteered for numerous research projects as a subject. She was born Eileen Jeanette Vancho Lyttle on March 17, 1893, at Beau Park, County Meath, Ireland. At an early age she exhibited paranormal ability, including Clairvoyance of the dead. Her family, however, was hostile to her visions, which they dismissed as fantasies, forcing her to find friends in a trio of imaginary playmates who stayed with her until she was 13. Garrett married three times. Her first marriage, to Clive Barry, produced three sons, all of whom died young, and a daughter, now Eileen Coly, who succeeded her as president of the PF. Following her divorce from Barry, Garrett ran a hostel for soldiers wounded during World War I. Many of them returned to the front after recuperating, and Garrett had precognitive visions of those who were destined to die there. One of her patients proposed marriage to her, probably as a last act (he had a premonition of his own death), and she agreed. One month after the wedding he was reported missing in action. Garrett sensed that he and several others had been killed in an explosion, as was shortly to be confirmed. In 1918, just before the end of the war, she married J. W. Garrett, a wounded soldier. The marriage to Garrett ended in 1927, after which she remained single for the rest of her life. In 1919, Garrett met writer and social activist Edward Carpenter, who was to have a profound influence on her life. Carpenter told her she had been born to a state of cosmic consciousness that others spent their entire lives searching for in vain. She began to see her perceptions not as fantasies or pathological hallucinations but as capacities for inner comprehension. This resulted in a dramatic spiritual experience in which she saw that her living in two selves (the “normal” woman and the medium) was the result of “positive powers beyond the range of contemporary understanding.” She felt her powers were not supernatural in origin but came from within her own deep unconscious. Around the same time, a frequent visitor to the hostel began to speak to Garrett about messages purportedly from his deceased daughter that he had received through a medium. Although skeptical, Garrett recalled the reception she had received as a child and gave the man a hearing. She accompanied him to the London Spiritualist Alliance (LSA; see College of Psychic Studies), where she witnessed a clairvoyant in action. Her curiosity piqued, she began to attend regular meetings at the LSA. At one of these meetings, she experienced her first involuntary trance, during which she spoke of seeing the deceased relatives of those present. The experience left her physically nauseated and emotionally frightened. Her husband forbade her to return to the group. She refrained from doing so but could not help trying to learn more about what had happened to her. At the suggestion of the LSA’s secretary, she consulted a hypnotist. In her first session, Garrett again fell into trance, this time under the control of an entity named Uvani. The hypnotist tried to convince her that Uvani was a spirit independent from her own personality, an idea so antithetical to Garrett’s own views that she broke off work with the hypnotist with the intention of abandoning her incipient mediumship. Before long, however, Garrett found herself back at the LSA, where she was introduced to more advanced mediums and was taken to Harry Price’s National Laboratory of Psychical Research and to the British College of Psychic Science (BCPS). At the latter, she met psychic researcher James Hewat McKenzie, who so impressed her that she decided to develop her mediumship under him. She later wrote that McKenzie was the first person she had met “who refused to take a pronouncement of a control personality as inevitably the word of some ‘higher power.’ ” McKenzie died in 1929, and Garrett severed her connections with the college soon after. Garrett’s interest in the academic approach to psychic phenomena led also to her work with Sir Oliver Lodge and Harry Price, among others. In 1930, her reputation received a strong boost from her communications concerning the R-101 dirigible disaster (see R-101 Case). In 1931, she was invited to the United States by the American Society for Psychical Research (ASPR) to participate in a series of experiments under the direction of Hereward Carrington. A few years later, she was tested by J.B. Rhine and J.G. Pratt at Duke University (see Rhine Research Center), where she also met William McDougall. Rhine considered her to be one of the finest mediums of the day. McDougall, she said later, persuaded her to continue in the new field of parapsychology at a time when she was thinking of ending her participation in experiments. In 1936, she assisted Nandor Fodor in his investigation of the Ash Manor Ghost. Garrett happened to be in southern France when war broke out again in 1939 and stayed there until 1941, when she was able to go to Portugal and then to the United States. She settled in the United States, becoming a citizen in 1947. She established a successful publishing house, Creative Age Press, in New York and published a less successful magazine, Tomorrow, devoted to parapsychological topics. Neither venture is presently in operation. In 1951, Garrett founded the PF to encourage organized Scientific research in parapsychology through grants and international conferences. Garrett championed this research in the hopes of bringing together science and religion to restore a spiritual power to religion. The PF continues to sponsor university research around the world and to conduct annual international congresses on topics in parapsychology, the first of which was held in 1953 at the University of Utrecht, in the Netherlands. In the 1960s, Garrett worked with psychologist Lawrence LeShan in his studies of alternate realities. She helped him describe the “clairvoyant reality,” a state of consciousness comparable to mystical states in which paranormal abilities function. In this state, there is a central unity of all things in a larger pattern; time exists in an eternal now; there is no “good” or “evil,” for the pattern of the universe is beyond that; and paranormal senses are better at obtaining information than ordinary senses are. For Garrett, the clairvoyant reality could be accessed through controlled breathing. Her experience in the state of clairvoyant reality, in which she could perceive past, present and future simultaneously, was exhilarating, and she had to learn to control her powers to avoid exhaustion. Uvani remained Garrett’s principal Control throughout her career. Although she had other controls, she was relatively detached from them. She regarded all of her controls as “principles of the subconscious” formed by her own inner needs. She was agnostic throughout her life on the question of Survival After Death. Garrett died on September 15, 1970, in Nice, France, following a period of declining health. 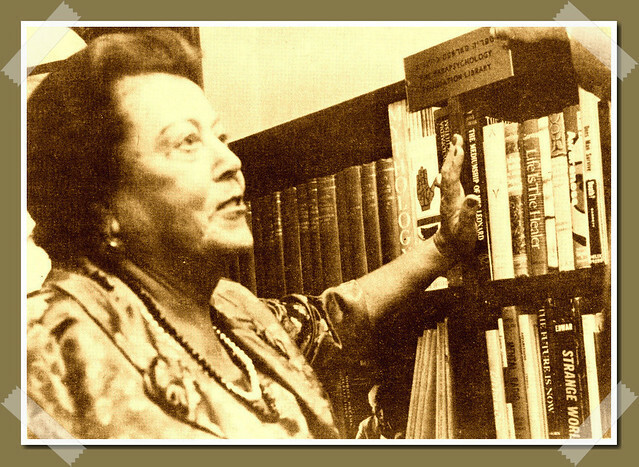 In addition to her legacy of the PF, she left seven nonfiction books on the paranormal, plus novels under the pseudonym Jean Lyttle. Garrett, Eileen. My Life as a Search for the Meaning of Mediumship. London: Rider & Co., 1939. ———. Adventures in the Supernormal: A Personal Memoir. New York: Garrett Publications, 1949. ———. Many Voices: The Autobiography of a Medium. New York: G.P. Putnam’s Sons, 1968. McMahon, Joanne D. S. “Eileen J. Garrett: A Woman Who Made a Difference.” In Lisette Coly and Rhea White, eds., Women and Parapsychology. New York: Parapsychology Foundation, 1994.